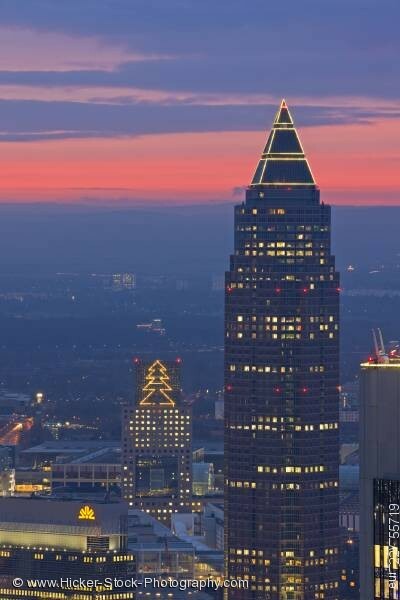 Stock photo of sunset over the Messeturm skyscraper and the City of Frankfurt am Main, Hessen, Germany, Europe. Stock Photos from the collection "All Pictures"
This stock photo shows the serene sunset over the Messeturm skyscraper that dominates the City of Frankfurt am Main, Hessen, Germany, Europe. As the peaceful sun sets over the industrious city of Frankfurt am Main, beautiful soft colours of pink, lavender, and blue highlight the beautiful evening sky. The towering Messeturm skyscraper stands tall in the foreground with white lights outlining the three sections of its pyramid shaped roof. Another building in the backdrop has white lights that outline a four tier Christmas tree on its exterior wall. Office lights glow from many of the office buildings in the misty evening of the busy city of Frankfurt am Main. Sunset over the Messeturm skyscraper and the City of Frankfurt am Main, Hessen, Germany, Europe.